Shouldn't be the back seam of the side panel on the back seam of the sleeve? The whole scye is about 7-8 cm wider than the one of the body part. I pinned the sleeve in (Ärmel eingesteckt) and I know the sleeve scye has to be a bit wider for the ease, but this is too much. Edited by SewingDominique, 11 July 2010 - 11:53 PM. Wow what an super armhole, should be in the books of records. He knows the crazy Germans. Not sure I understand your question. Back sleeve pitch location has nothing to do with side panel, unless you are talking about body coats. Shouldn't be the back seam of the side panel on the back seam of the sleeve? Not unless you specifically engineer the draft to work out that way. And, it typically requires at least one proof to get it right. I only do this for complex backs, like a yoked back (e.g. denim jacket) or a "scalloped" back. I understand. I just thought it should be seam on seam. I have the feeling that the back scye depth with 1/8 Chest + 1/16 body height is a little bit too short. I would add 0.5cm like Rundschau did in 1960. It would mean the sleeve cap need 0.5cm more height. 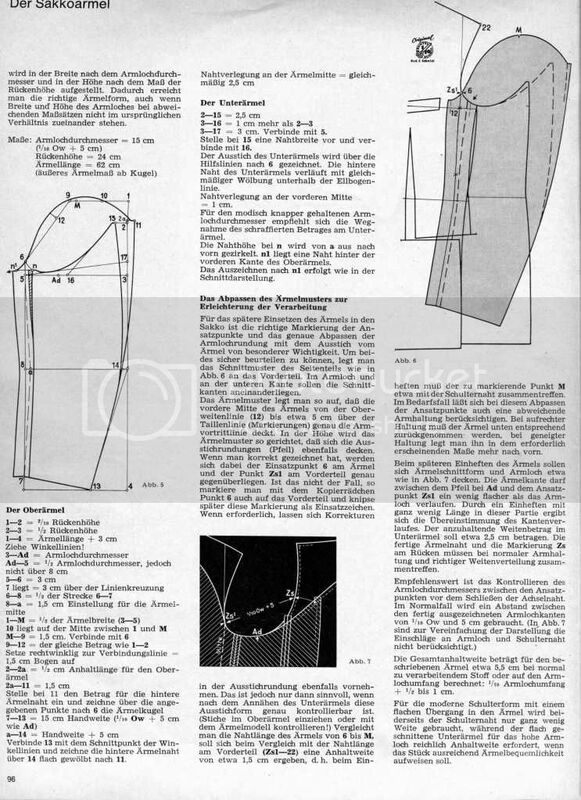 I also would not subtract 0.5cm measuring the armhole height - sleeve cap as it would result in a 'Heberolle' which produce a fold under the arm which can be seen from the front. I wish there were people in this forum who had a substantial meaning about that, have to check the Dietl draft. About 'Heberolle'? What do you want to know about it? The "Heberolle" is a term falsely used in this content, at least when it's meant to descibe the length under the armhole, which is referred to as "Hebelänge" (additional length in the under sleeve to allow you to better lift your arms). Die Heberolle,as I understand it, sits in the back of the sleeve and depends on the shape of the under sleeve. If you add "Hebelänge" by shortening the crown height you will need a wider crown to regain the original ease in the sleeve. The wider and shorter the crown, the less clean the sleeve will hang, and yes, that length will most likely show under the armhole. The straighter the shape of the crown, the easier it is to set the sleeve in. Reason for this is that with a straighter (less slanted) line the distance between 2 points on 2 lines is shorter.So, for a fuller sleeve in the front you have to draft a crown where point K is further away from the armhole. My thought was only if the back depth better should be 1/8 chest + 1/16 body height + 0.5cm like in 1960. I feel the proportion is a little bit too tight without 0.5cm. As for the sleeve cap height I would prefer not to subtract 0.5cm but would rather take the whole length measured to avoid Heberolle. It is called Heberolle what is under the Arm caused by a 0.5... 1cm shorter sleeve head cap to produce Hebelänge. I read that throughout the East German Literature. 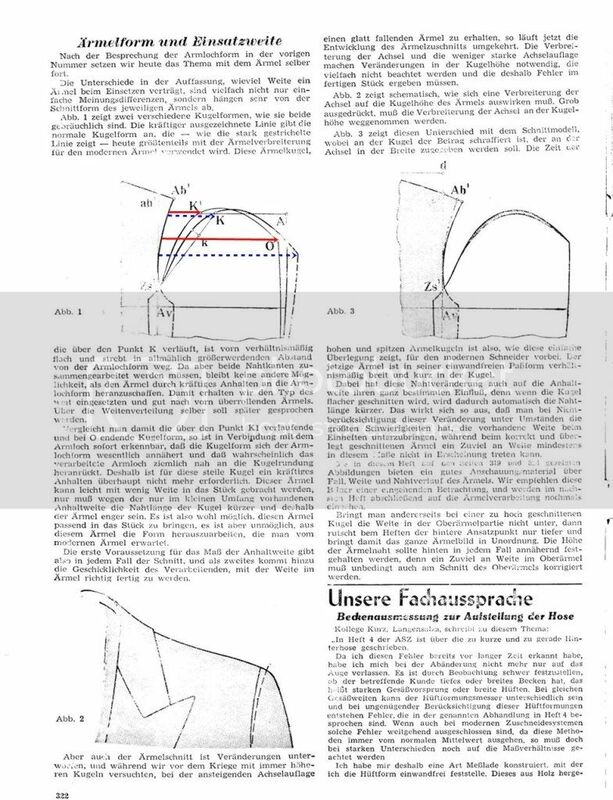 West Germans did not even know the term cause they drafted something they didn't really understand and they mixed Heberolle together with sleeve cap height and sleeve length throughout the books. In 1969 they got so confused with that, that they abandoned the Heberolle draft as it made no sense. In reality they still had a secret Heberolle of 0.5 which is not wrong. East German Cutters also mixed with the Heberolle around and abandoned it already in 1967. I would not say a 0.5cm Heberolle is wrong it allows you to make the sleeve cap a little bit wider but it could produce a small bulb in the front. To check that out is rather tricky cause you have to measure in the mm on round seams. When 3 people measure the armhole depth they get 3 different results cause you have to hold and open the armhole in a proportional way of the Armscye width, so the measured depth is always a little bit different. Indeed a corpulent person who wears his arms a little bit side wards need Hebelänge in order to avoid wearing folds in the sleeve cap. Für den hinteren Unter-Ärmelabschnitt, der voll geschnitten sein sollte, wie auch die richtig Lage der hinteren Seitenspitze von 6cm, um einen vollen Hinter-Ärmel mit Bewegungsvolumen hinzubekommen, da gibts Abhandlungen, wie oben von SG. Losberg setzt die Seitenspitze sogar auf 7.5cm fast, der hat eine Bequemlichkeitsmacke. Dietl has 11% in his sleeves, I would rather use 12%, more than 12%, I would say it is too much for today's fabric, 11.5 - 12% should be perfect. He also uses the full armhole depth in the sleeve cap. Edited by Der Zuschneider, 18 September 2012 - 12:24 AM. 12% ease in a sleeve made from Super 130's and higher is just suicidal. Stick to 7%, should be fine for almost all fabrics. If you want a fuller sleeve in the front move the Kp 1 cm backwards to create a flatter curve in the front sleeve crown. In RTW and MTM factories the sleeves are set with a special machine. It's easier in RTW, since it's always the same sleeve for an armhole size, so the machines just need the exact starting point (front sleeve pitch) and the rest is computerized sewing. I don't know how it's generally done in MTM factories, but the same machine can be operated manually, which needs practice and skill. Over the last 8 years I've seen some pretty badly set (MTM) sleeves, and in most of the cases the notches were wrong or as in the case of the Cove sleeves, there was too much ease left in the undersleeve. 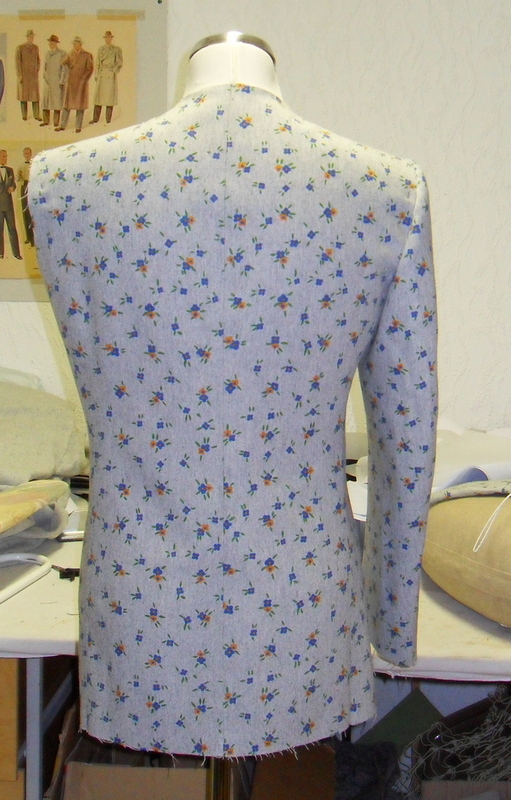 Simplest solution so far (old bespoke tailors trick from ages ago): Try to hide the excess under the arms. Not pretty to look at, but easier than making a better pattern. Yes, SG, 12% can be horror. 11% is rather secure. The access under the arm is already included to get the maximum in. About 10% could be with 6oz fabric. Even if I would need less than 10% which I doubt right now I can draft that. I am calculating with the seam outside and I know exactly also what is inside the seam. I have a full prove sleeve draft taking it with me into my coffin like all the other things as well. People are not interested for this knowledge other than for free making money. So is the tailoring every tailor takes every knowledge with him into the coffin. coffin, graves, secrets including perfect sleeves, Oh my! Tailors love their loose screws. The book cost a pretty penny and it shows how difficult tailoring developed from 1300 A.D. The little wage a tailor got and how the tailors hid their knowledge not to be seen by other tailors to weed out competition. I was lucky to get the book for 35Euro. I can sell it if someone wants to read it. Edited by Der Zuschneider, 24 September 2012 - 12:14 AM. Something similar is mentioned in the book "The Abruzzi tailors". Setting sleeves was such a big secret, that the master didn't allow the apprentice or journeyman to watch. One actually paid for being allowed to set the sleeves. Tailor/ dressmaker is one of the lowest paid jobs where a qualification (apprenticeship) is needed. No wonder young people have always tried and still try to do something else for a living. Still, sleeves are an interesting matter. Some praise the "curvature" of a sleeve while the rest of the coat is a complete wreck, others don't care about the look of them at all, as long as the sleeve has a fancy name and/ or comes from a famous tailoring house. To find the ease you are happy with stylewise (flat, "normal", Neapolitan or roped) I'd recommend to do some experiments. If you can, use checked material to see whether there are distortions and how the sleeve hangs. Yes that sounds good, but we need to keep the secrets or tailoring wouldn't be fun. Gotta have a mystery you know to keep us on the edge of our seats and up alll night wondering how they done it.